It's very rare that my wife and I travel east when we go out to eat, but we're glad we did last night. 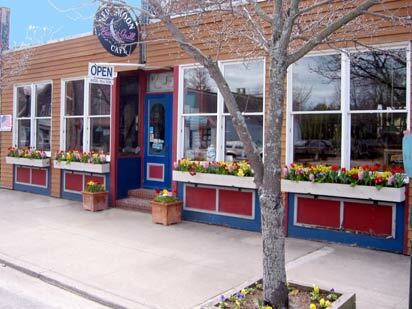 After some searching around, my wife wanted to go to The New Moon Café in East Quogue. Driving there at night was a little confusing because I wasn't sure if my GPS was taking me the right way. Once off of Sunrise Highway, it seemed like a lot of dark, desolate roads, but we got there! Perhaps taking Montauk Highway would have been easier. We pulled into a small, quaint looking town with only New Moon and a local bar open. As we walked in, we were greeted by the owner, Ron, with his southern twang adding to the ambiance of the restaurant (Read about him and his restaurant on their website). 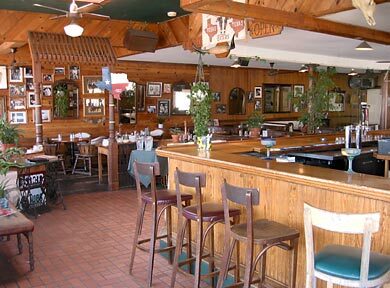 The place had a Texan feel with its flags, wall hangings and brass-studded chairs. The decor is great but the wood floors look like they need to be cleaned and refinished due to excess wear over the years, but don't let that deter you from going there! The menu has a mix of classic appetizers, sandwiches and burgers, texas-sized steaks, BBQ and tex-mex. There is a large choice of desserts which are all house-made, including the delicious whipped cream. A pleasant waitress took our order, we received our food, and at some point in the night the owner came to check on all the tables personally. I must say, overall service was a little slow, especially for not having a full house, but the friendliness and comfort delivered by the staff more than made up for it. The food was what you'd expect from a Texas-style family-run restaurant--comfort food and large portions. For some of the items on the menu, I thought the prices were a little high. But then again, I didn't try the dishes out for myself so for all I know, they could have been worth it. This is definitely somewhere I see myself visiting again. For a warm, welcoming experience and some classic Texas BBQ, check out New Moon Café!